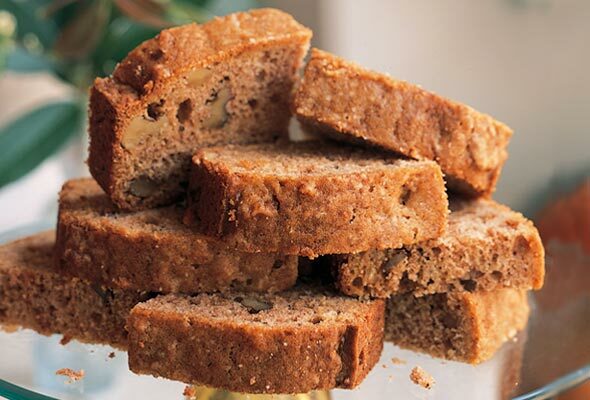 Though this quick bread is far from pretentious, it certainly has pedigree–and you don’t need to know its geneology to know this. One taste tells all. 1. Heat the oven to 350°F (175°C) and lightly butter and flour a 10-inch tube pan or two 9-by-5-inch loaf pans. 2. Combine the flour, baking soda, baking powder, salt, and cinnamon in a large bowl. Scoop out about 1/4 cup of the flour mixture and combine it in a small bowl with the chopped walnuts, tossing to coat the nuts. 3. In a medium bowl, combine the butter or oil, eggs, sugar, grated pear, nuts, and vanilla, and stir to mix everything well. Scrape the pear mixture into the flour mixture and stir just until the flour disappears and the batter is evenly moistened. 4. Quickly and gently scrape the batter into the prepared pan(s) and bake at 350°F (175°C) for 60 to 70 minutes, or until the bread is handsomely browned and firm on top and a wooden skewer inserted in the center comes out clean. 5. Cool the bread in the pan on a wire rack or folded kitchen towel for about 10 minutes. Then turn it out onto a plate or a wire rack to cool completely, top side up. Serve as is, sprinkle with confectioners’ sugar, or ice with a simple Buttermilk Glaze. 6. In a medium saucepan combine the buttermilk, sugar, butter, cornstarch, and baking soda. Bring to a gentle boil. Remove at once, stir well, and cool to room temperature. Add the vanilla and then set the glaze aside until the cake is done. Spoon the Buttermilk Glaze over the warm cake and cool completely. Pear Bread Recipe © 2007 Nancie McDermott. Photo © 2007 Becky Luigart-Stayner. All rights reserved. All recipes and photos used with permission of the publisher. This bread/tea cake is so good and even better the day after it’s baked. If you can wait that long! The bread works with both pan suggestions (with some tweaking in baking time) and with both fat suggestions. The textures and flavors change a bit though. I prefer the glaze when it’s allowed to boil for a minute or two. The sugar starts to caramelize and it’s so good. This recipe is already a favorite in my household. I’ve had three requests for it already. It has great texture, a fine crumb, is nice and moist, and not overly sweet. Some errors are worth making, and I’m sticking with mine. Adding both the butter and the oil may seem like too much—I thought the bread would turn out oily—but it was perfect. Using pears is also a pleasant change from banana or apple, and the buttermilk glaze was a nice finish. This recipe is worth keeping and passing on to the children and grandchildren. I wasn’t going to make this bread, thinking pear season was pretty much over. While shopping, however, I came across some perfectly ripe yet firm Bartletts. I was glad I did. This cake smelled wonderful while baking, sweet and warmly spicy, and tasted just as delicious. It was moist and dense with nuts, buttery, and nicely pear-flavored. The glaze, while probably not really necessary, was a tangy addition. A terrific breakfast with a cup of steaming coffee. Also delicate enough for a light snack with tea. It kept well, both at room temperature (for several days) and frozen. I made this bread and am quite pleased. I baked it in a 10-inch tube pan. I used whole-wheat flour in place of all-purpose flour; oil instead of butter; 4 red pears (purchase weight: 2 pounds) and coarsely grated the pears using the largest holes of my box grater. I baked it for 60 minutes, and it looked exactly like the photo. I wouldn’t suggest trying the buttermilk glaze, though, because the glaze never hardened. It was pretty on the bread, but I like my glaze to harden so I can wrap a slice with plastic wrap. Next time, I’ll just sprinkle the bread with powdered sugar or just leave it plain. I’m so pleased that you made Cornelia Walker Bailey’s Pear Bread, from my cookbook, “Southern Cakes.” I’m sorry that the Buttermilk Glaze didn’t work out for you, and I like your idea of finishing it with confectioner’s sugar instead. I’m delighted that you adapted the recipe with whole-wheat flour instead of all-purpose flour, oil instead of butter, etc. You’re using the recipe as a map, a guide, rather than a sacred text. Happy cooking! I felt that I needed to make a second comment. I have already baked this recipe 3 times. I love this recipe; however, I had to make some changes with the amount of oil (if using oil instead of butter). I read somewhere that if you replace oil for the butter in baking, you need to use less oil (1/4 tablespoon less oil for every tablespoon of butter). My first recipe was a success using a full 3/4 cup of extra light olive oil; however, the bread will become more moist as it sits. So overtime, (3-4 days later), the bread was very moist. So I decided to try the recipe again using 1/2 cup plus 1 tablespoon oil and increasing the grated pears by 1/4 cup. By doing that, the bread was still moist, but not overly moist, especially as it sits after a few days. The bread still tastes delicious like the first time. I also added 1/4 teaspoon nutmeg which enhance the flavor even more. For the glaze, I used 2 cups confectioners sugar and 3-4 tbsp. pear juice, water and/or milk. The glaze hardens so I can easily pastic wrap a slice on the go. My finger was too quick on the clicking, but this is a 5-star recipe. I made this bread and used Ya pears. At first, I decided not to make the glaze because my husband doesn’t like frostings. Without the glaze, the bread was good. But when I later made the buttermilk glaze, the bread was really really good. As what some of the other posters said, the glaze will not harden but it will moisten the bread and add to its flavor. I feel it is an essential part of the bread. Even my frosting-averse husband agrees that it is best with the glaze. Thanks for generously sharing your recipe! Esther, so great that you AND husband agree on the need for the glaze. It really does enhance the bread. Maybe we can get him to start eating frosted cakes…?! 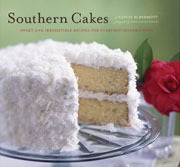 I’ve owned “Southern Cakes” for a year now, and this recipe is only the latest and greatest recipe I’ve tried. I used a combination of oil and butter in my cake, and topped it with a quick maple icing. Packs well in the lunchbox, delicious for breakfast, teatime, or dessert. I’m really looking forward to making it again. I love the Sweet Potato Cake, too. I made this with pears I had canned this past summer, and spelt flour to replace the all-purpose flour. I used unsalted butter, and everything else is just as per the recipe, including the glaze. It’s delicious! I have so many canned pears I need to find ways to use them, and this was an excellent way! Thank you for the recipe. You are more than welcome, dear Jennifer.